Ham Radio Tiny IBM PS2 Keyboard CW Keyer Interface | The Wonderful World of Microcontroller! The Experiment: Ham Radio Tiny IBM PS2 Keyboard CW Keyer Interface. Build a (Ham Radio) Tiny IBM PS2 Keyboard CW Keyer Interface around an Atmel ATtiny85 micro-controller. Looking through the KX3 user manual (Data Modes) read that the KX3 supports data operation via a computer and special software. So launched the K3 & KX3 programing reference manual and found the (KY) command will send Keyboard DATA through the RS232 port, but there is a 24 character limit. Back to the KX3 user manual read that the KX3 can convert CW form the CW KEY jack or the KXPD3 paddle to FSK D & PSK D Data. Since the KX3 can decode CW, PSK31 (PSK D) and RTTY (FSK D) on the display. Decided to build a ATtiny based Tiny IBM PS2 Keyboard CW Keyer Interface. The challenge, the ATtiny85 only has 8-pins, 8KB ISP flash memory and pin1-4-8 are dedicated to Reset-GND-VCC. So the first thing to do, assign the available pins. 1. 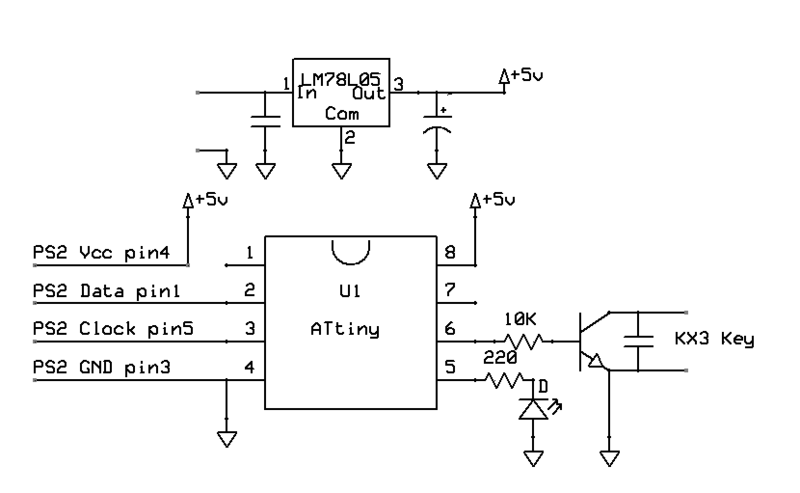 The ATtiny85 only has 1(one) hardware interrupt: INT0. However, the micro controller can have an interrupt attached to any pin 0-5.